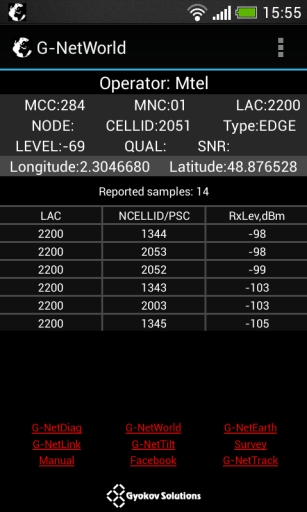 On the app the values for serving cellid, level, network technology and neighbor cells are displayed. The measurements are uploaded automatically when the app is running, data connection is available and you have GPS fix. The measurements are uploaded until the app is closed via Menu - Exit. The measurements are available on the server one hour after upload. In order to report correctly the cellid the app keeps the screen on while running. The app has option for auto start on phone boot - in Settings.